We leaped into February with the typical high expectations of knee-deep snow and record setting cold as years of brutal winters have conditioned us to know. However, February displayed a spring-like pattern more typical of March at times, throwing many of us for a loop. But as we look back, it was quite evident that this February followed no true mold, but instead delivered weather of all types and sizes. We piggy-backed off a cold end to January, with an arctic air mass still parked over the region. This set the stage for a fluffy snowfall for the month’s opener. It didn’t amount to much, just a general 1.0-3.0” from the Nation’s Capital to Harrisburg and Philadelphia, but it was enough to trigger snow removal efforts. This clipper-system would also mark the coldest point of the month as low temperatures settled into the teens and single digits for most, with even some below zero readings on the 1st and 2nd. As high pressure departed, the cold snap eroded with warmer air melting any trace of snow from month's past. Temperatures soared well into the mid-60s from Philly to Boston on the 5th with near-record warmth from Baltimore-Washington as temperatures peaked around 70-75°F. However, on the heels of this warm spell came another wintry threat. 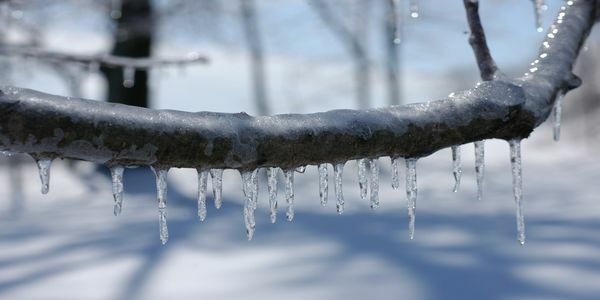 A storm system barreled across the Ohio Valley and into Upstate NY, bringing a mixture of sleet and freezing rain across interior areas of New England, with high pressure keeping things relatively cold at the surface. This setup led to ice accumulations anywhere from coatings to about 0.25" in spots. From there, daily high temperatures continued to fluctuate between the 30s and 50s as the first third of the month quietly exited, with no notable events. The next system then took shape out over the Rockies, moved across the Mississippi River Valley and took aim on the Northeast by Feb 12th-13th. What began as a normal snow storm quickly turned into a traveler’s nightmare with a barrage of heavy sleet/snow and freezing rain blanketing much of the region with several inches of a dense accumulation. By mid-month, the weather pattern became much quieter, outside of a few daily scattered snow showers. To this point, seasonal snowfall was running well below average for many, but Mother Nature was just getting started. Another storm started to take shape, with low pressure building off the north Atlantic coast on February 17th and 18th. While it may not have amounted to much, a general 2 – 5” fell across northern New England, which was enough to double Boston’s existing snowfall totals for the season. With cold air in place, the active pattern continued as a another system arrived on February 20th, which proved to be the central mid-Atlantic’s biggest snowfall of the month. Like its predecessors this winter, however, it too carried combinations of snow, sleet, and freezing rain; upwards of 6 – 8” fell in portions of northwest Maryland and south central Pennsylvania. As for New England, snow wasn’t the main concern, but a decent amount of icing occurred, with areas across Central and Interior areas of Massachusetts and Connecticut seeing up to 0.25”+ of accretion. This lead to widespread downed trees, power outages, and multiple car accidents. The last week was where we really started to see things ramp up. A series of storm systems developed from the 25th through the 28th, bringing multiple rounds of wintry weather all across the Northeast, with the highest snow accumulations taking place over interior New England (2-4" from Concord to Boston). The coastal-like storm track during this last week of February was in stark contrast to what had been the “usual” track over the month. This active pattern continued into the first week of March, which eventually helped bring multiple cities along the I-95 corridor to or near their average snowfall for the year.